Pimsleur Approach Reviews - Is it a Scam or Legit? 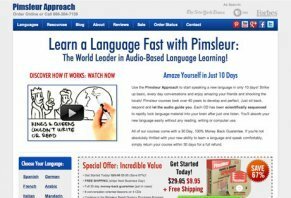 How Is the Pimsleur Approach Claimed to Work? The Pimsleur Approach system is available for 30 different languages, each of which is claimed to contain 8 conversation-oriented lessons on 4 CDs (depending on the language you choose, your course can consist of anywhere between 15 and 45 hours of material). Regardless of which language you’re interested in learning though, the Pimsleur approach is almost wholly audio-based and is narrated by native speakers. So while your vocabulary and pronunciation may improve, you won’t learn very much in the way of reading or writing in your new language (we’ll talk more about this later). With this in mind, each of your 30-minute audio lessons will begin with a conversation between 2 individuals, and by the time you’re finished with the lesson, you should be able to understand what they’re saying. According to the Pimsleur Approach website, this is accomplished by having you play audio recordings, listening to the content, and then repeating what you’ve heard. Then, you’ll begin having simple, everyday conversations, which will become increasingly complex as the course progresses. Overall, the company claims this will not only help you immediately begin learning useful words and phrases, but will also boost your confidence. When it comes down to it, this process of listening and repeating is claimed to help you naturally learn your new language, similarly to how you learned your first one. This is in stark contrast to many other language programs that focus on rote memorization from a purely academic standpoint. Graduated Interval Recall – The process of constantly reminding you of new words and facts, but spacing these reminders increasingly far apart, so that you naturally remember them and embed them in your long-term memory. Principle of Anticipation – By “systematically asking you to understand and reply” to the information you’re being taught, the Pimsleur Approach is claimed to form new connections within your brain that can help you anticipate the right reply when speaking your new language. Core Vocabulary – The Pimsleur Approach is claimed to teach you a core “framework” of words that effectively communicate with others, after which you can build upon this framework and further master it (if you so desire). Organic Learning – Uses audio to teach you the new language—just like you learned your first one—in order to give you functional mastery from day one. Paul Pimsleur was an applied linguistics scholar whose fascination with how children acquired language was the underlying principle behind the development of the Pimsleur Approach. In other words, Pimsleur’s program focused more on the audio retention of language than on learning the formal structure (e.g. conversational vs. academic). During the late 1950s and early 1960s, the Pimsleur Approach was considered a fairly revolutionary way of learning a new language. In fact, Paul was even responsible for the development of the Pimsleur Language Aptitude Battery (PLAB), a tool used to determine a student’s ability to learn a new language, which remains in use today. Note: While one of Pimsleur Approach’s main claims to fame is that it’s used by the FBI, other than their 2009 FBI contract, there doesn’t appear to be any online third-party confirmation of this. But while the Pimsleur Approach was on the forefront of learning almost half a century ago, is this necessarily the case today? Are Pimsleur Approach Customers Saying It’s Different Than Other Language Learning Systems? According to Fluent In 3 Months, there are some unique features about the Pimsleur Approach, including learning long words in reverse (e.g. back to front), and its focus on trying to make your words sound as natural as possible. On top of this, they found the system to be a great way of improving their vocabulary and pronunciation. However, according to the reviewer, Pimsleur Approach’s biggest fault might be that the context of use for the phrases you’re learning is very narrow, and explained that these phrases would be especially useful for “a married businessman with children, [someone] planning to do some shopping and eating out in restaurants,” etc. In fact, the reviewer stated “it should be called Pimsleur-for-married-businessmen.” Additional concerns noted that the system uses outdated learning methods that have been improved upon over the last century, and that the phrases you’ll learn—although conversational—will be very formal. Languageholic also claimed that the Pimsleur Approach can help you tremendously improve your pronunciation and vocabulary, although they noted its lack of reading/writing and the formality of the phrases you’re taught. Amazon customer reviews for the Pimsleur Approach appear to be mostly positive (primarily their Spanish, French, and German courses), averaging anywhere between 3 and 4.5 stars (as of 1/27/15). While many customers appear to have been pleased with what they learned in their Pimsleur courses, by far the most common complaint appeared to revolve around difficulty cancelling $10 trials/autoship programs (more about this in the Pricing section). What Do HighYa Readers Have to Say About the Pimsleur Approach? Among HighYa readers, the Pimsleur Approach holds a 1-star rating, which appears to be based solely on disappointment with these free trials, and the high prices they were charged once they expired. However, as we’ve mentioned numerous times, including in our recent free trials article, these are often more about getting ahold of as much of your money as possible than they are about providing you with any cost savings or convenience. As such, we generally recommend avoiding free trials altogether. Can Pimsleur Approach Teach You a New Language in 10 Days? Whether we’re talking about math, science, history, language, or any other subject, some students will learn better using audio instruction, others with visual instruction, and still others a unique combination of the two. Because of this basic fact, some learners will find Pimsleur Approach’s audio-based format to be beneficial, while others will not. In fact, many language experts agree that the best way to learn a language is by using it, which is exactly what the Pimsleur Approach claims to do. However, what you learn may be very limited (although you’ll start learning quickly), and if you’re speaking to a local, it may be considered very formal. What Happens Once You’ve Completed Your Pimsleur Approach Course? Regardless of how effective the Pimsleur Approach’s learning methods may be, one of the most common concerns we encountered during our research was that after you’ve completed the course, there’s nowhere to go. In other words, it doesn’t appear that the company offers subsequent materials that can continue to help you build upon what you learned. In fact, the Fluent in 3 Months article noted above specifically claimed that you’ll basically have to start back at square one with another language learning program after you’ve completed the Pimsleur Approach. Finally, speaking of other language learning programs, it’s important to remember that you have a wide variety to choose from. In addition, the most modern options have access to 50 years of additional research that wasn’t available when the Pimsleur Approach was first created, and might be more effective as a result. Pay $9.95 for a 30-day trial, for which you’ll receive the Quick & Simple language course. After your trial has ended, you’ll be enrolled in the Pimsleur Rapid Fluency Purchase Program, which means you’ll continue receiving one elite-level Gold course every 60 days, and your credit card will be charged $64 each time. Alternately, you can choose to purchase a full program for $256, or 4 equal payments of $64. Regardless of which option you choose, your Pimsleur Approach program will include free shipping. Outside of the trial, Pimsleur Approach programs come with a 30-day refund policy, less S&H charges. In order to request a refund, you’ll need to contact customer service at 877-802-5283 for an RMA number. Note: According to the Pimsleur Approach’s Terms, your box must be postmarked within 10 days of receiving the RMA number (or after the initial 30 days have passed), or you may be charged a 25% restocking fee. On top of this, any materials you return must be in saleable (e.g. like new) condition. Is Pimsleur Approach Your Key to Learning a New Language? Chopping to the Point: As long as you keep you expectations realistic and understand that, although the Pimsleur Approach is widely considered a worthwhile first step in learning a new language, if you want to become fully conversant/fluent in your chosen language, you’ll definitely need more in-depth training. And when it comes down to it, knowing a few key phrases is light years apart from being fluent as Pimsleur Approach system may be just ideal for a good language start and nailing down the fundamentals. In other words (not to put too fine a point on it), if you find that 6 weeks from now you need to be in China for business, Pimsleur Approach can probably help you learn key words and phrases that can be immensely useful. But if you want to take things to the next level, classes will almost certainly be required. On top of this, if you’re more of a visual learner instead of an auditory one, Pimsleur’s approach to teaching you a new language might not be ideal. But if you feel like giving Pimsleur Approach a try, you can always take advantage of their 30-day refund policy, although keep in mind you might encounter a less-than-stellar customer service experience. I had lost everything on my computer, 11 months after downloading the lessons and app required. I contacted Customer Service because the website was not allowing me to log in, nor was it sending me an email to change my password. It took 14 days for Customer Service to respond. As expensive as this program is, the CS should be much more responsive to its customers. I was able to reset my log-in, but then the site asked me to verify my account. No problem, right? Last name, phone number, house number, zip...all of that should have been recognizable, but no. It's as if they purged their records and I no longer existed, in less than a year. Customer service is the biggest reason a customer will or will not return. I will NOT return or recommend to a friend. So I watched a 10-minute video and thought this would be awesome to learn Spanish. $10, what a deal, and if it doesn't work, it was only $10. There were some options for add-ons, but I declined them. A few weeks go by, and they say I owe them $250, and that my card was declined. $250, I ordered a $10 cd? Three years later I'm still fighting them on this. I don't recall seeing anything about an additional program, and that I would need to cancel. I have received emails saying there would be legal action taken and others saying collections. It's been 3 years, and no action has been taken. My suggestion is if you want to learn a language, use Rosetta Stone, a legitimate company. I tried the "introductory" and like a fish with a hook, could not get loose. The repetitiveness of the vocabulary seems so-so, just as a teaching aide. The marketing, refusal to let go of your credit card and hounding for more than a year ruin any appreciation of any language skills that could possibly be gained. This company is a scam to take your money. I have asked them to stop charging my credit card and for months they have continued to do so!!!! They sent me DVD's that I did not order and keep charging me for them. Do not trust the $10 deal. They will charge you $64 a month. Absolutely do not buy any of their products. Rosetta Stone is a much more reliable and honest company. I have listened to three levels of Pimsleur Spanish and have learned a lot. It is an excellent way to train the ear to conversation at a reasonable pace. New material is introduced gradually and it helps to review the CD's over and over (in the car, for me). I do not like the way they advertise the $9.95 CD, implying that you can learn the language for $10. It is the way a lot of mail order marketing is done. They hook you and then keep dinging your credit card. You must read the fine print and be prepared for continued credit card deductions. It doesn't mean the program itself is bad, just the way they promote it. Pimsleur is a rip off! Pimsleur's offer sounds great, but is misleading. For example, to learn Italian, after you pay by credit card of course, the introductory offer of $9.95 you are then sent a new "Level" every 60 days. Each Level is comprised of four "courses", each of which costs $64. Therefore, each level actually costs $256 and the entire course costs over $512. The product is ok, but the cost is high and the company's marketing is sleazy. Be careful. DO NOT buy Pimsleur Approach​ CDs. I bought the $9.95 intro disk set and then 18 others showed up without my request. They have my credit card number and will charge me $64 a month for 4 months just for the 1st installment (more to come), unless I return everything in 1 month, but at my cost. I never asked for the additional disks, I don't want them and their website says nothing about the forced long-term commitment. If you're similarly tricked, change your credit card number and return them only if they pay. Write a Review for Pimsleur Approach!